With THE ART OF NOISE’s influential and innovative reputation, this live gig was never going to be an ordinary one. 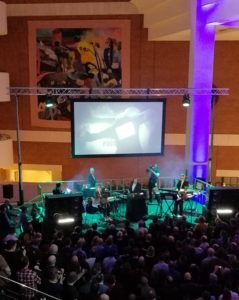 The British Library is certainly not your run of the mill venue either and this show was part of ‘A Season of Sound’, a celebration of the Library’s extensive Sound Archive which hosts in excess of 6 millions recordings. 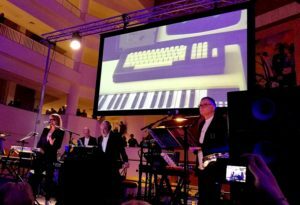 With their reputation as early pioneers of sampling and use of the Fairlight to grab found sounds alongside more conventional drums and synth textures, this reboot of THE ART OF NOISE made a perfect fit to help celebrate the Library’s own collection of audio. 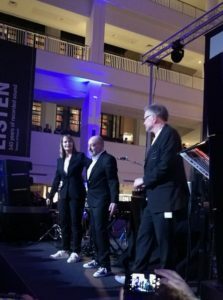 Special mention must be given to the show’s sound system, a sonically stunning Bowers & Wilkins set-up which throughout the evening delivered audiophile quality live sound, something which you rarely get at gigs these days. The sound system, a cut-down version of the one used at Primavera Sound Festival, which was apparently worth close to a million Euros became a real draw for crowds there. The PA system was put to good use prior to the band coming on stage, with the audience being treated to a superb ‘Blessed Are The Noisemakers’ mixtape by Kevin Foakes aka DJ Food, with different AON-related tracks like remixes of SCRITTI POLITTI and FRANKIE GOES TO HOLLYWOOD plus snippets of 10CC in ‘Life is a Minestrone’ and ‘I’m Not In Love’ in honour of Lol Creme who was a member of both acts. As the band walked on stage, the screen behind became a Fairlight boot-up page, with each musician being ‘initialised’ in a kind of homage to KRAFTWERK who apparently shelved their ‘Technopop’ album after hearing AON’s pioneering sampling work. Sadly there were no actual Fairlights on stage, but each member had Mac screens with the iconic green on black text to reference the machine which was so pivotal to the band’s sound. 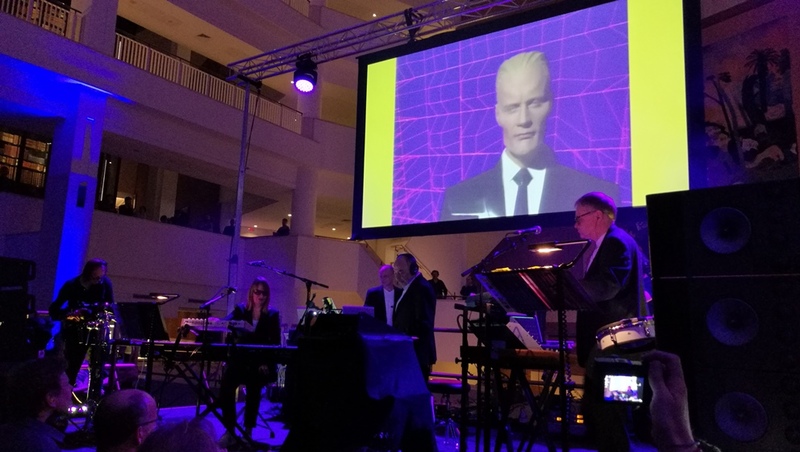 From left to right the set-up was Anne Dudley on synths / digital piano / electronic percussion, Gary Langan on mixing duties / percussion and JJ Jeczalik on Arturia Matrixbrute synth / Roland electronic percussion. Also present but via a couple of pre-recorded video clips was ex-member Paul Morley… this was a bit of a surprise as the ZTT split with AON was very acrimonious. Although billed as an ‘In Visible Silence’ gig, the show was still very much a greatest hits set, with a few choice cuts taken from the trio’s aforementioned second album. After introductory track ‘Instruments Of Darkness’, there was an early airing of ‘Beatbox’ from the band’s debut EP ‘Into Battle With…’ followed by an all-too-short rendition of ‘Camille’, the band’s ‘Moments in Love’ Part Two. ‘Paranoimia’ featuring Max Headroom was next to appear with suitably appropriate graphics behind the band before the stunningly beautiful ‘Moments In Love’. This was preceded by an introduction from JJ on the various uses of the track, from a Brylcreem advert through to its usage at MADONNA’s wedding to Sean Penn! To keep the sample trainspotters happy, there was an interesting mid-set diversion when JJ explained the background behind some of the AON samples used. This included the rhythm track for ‘Eye Of A Needle’ which samples the sound from a squash game; the ball being hit, the squeak of a training shoe on the court and the start of a groan from the impact of someone being hit by the ball. Also included was a special mention for the cash register sound which also ended up on ABC’s ‘Date Stamp’ from ‘The Lexicon Of Love’. One of the more experimental pieces from the bands’ back catalogue, the Steve Reich-inspired ‘Opus’ with its looped / cut-up vocals was up next, followed by AON’s breakthrough hit ‘Close (To The Edit’). Complete with an extended and very comical three-way car not starting sample-off; this track received the best reception on the night and the now iconic “Hey!” vocal additionally recalled THE PRODIGY’s ‘Firestarter’ which sampled it. 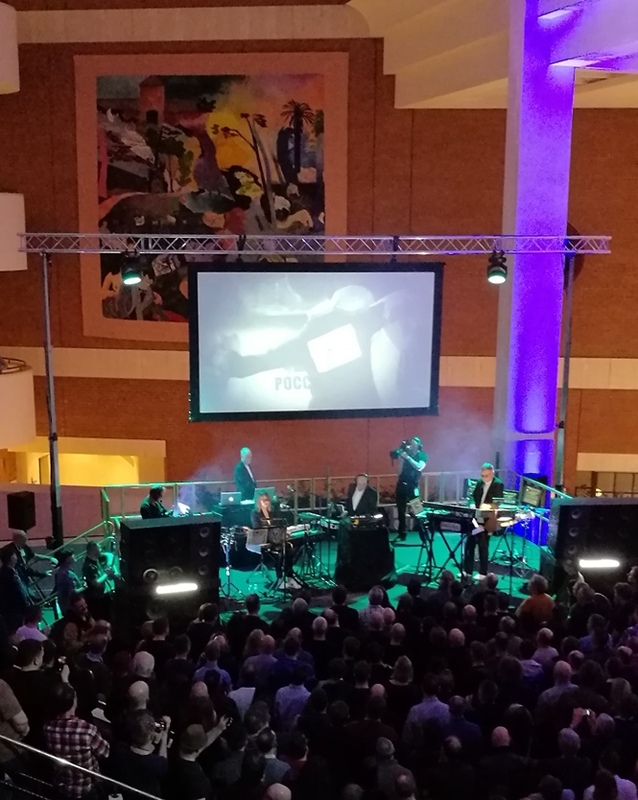 After a short break, the band came back on for an encore of ‘Peter Gunn’ with its Rik Mayall promo video projected behind, as the trio left the stage to a rolling set of credits behind them. This gig was a real bucket list moment for many, the band had supported THE HUMAN LEAGUE last year in Liverpool, but live shows by the ex-AON members have been few and far between. The deservedly rapturous reception that Dudley, Jeczalik and Langan received for their British Library gig should hopefully spur them into doing more dates as they are an utterly engaging live act with a pioneering back catalogue that is more than worthy of being re-visited. 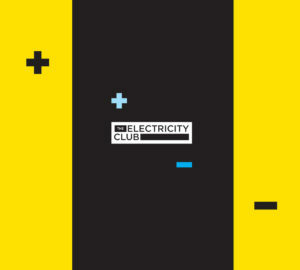 If you get a chance to see this line-up (especially with a B&W sound system), don’t hesitate, it’s a timely reminder of how incredibly influential AON were and helps to cement their position in electronic music history.